For those who don’t know, one of my other interests is handgun ballistics research. Specifically, in regards to how barrel length effects bullet velocity for different cartridges and loadings. Even if you don’t like guns, the physics behind ballistic performance can be very interesting. Let’s talk a bit about .44 Magnum cartridge. Despite of being very close to diameter of .45ACP the .44Mag is totally different beast. Average .45ACP round generates ~650J of hit energy while .44Mag makes easily 1600J and can be pushed much more beyond that. This specific gun however cannot utilize all potential of .44 Magnum cartridge because of very short barrel. It simply cannot burn all powder. As you can see there is huge cone shaped spray of unburnt stuff flying in the air. With longer barrel show would be different. Ok, you may have noticed the flames. They are something we haven’t seen before. Especially when you look picture below and huge left side flame in it. Interesting thing is that major amount of the flame is escaping between cylinder and barrel. 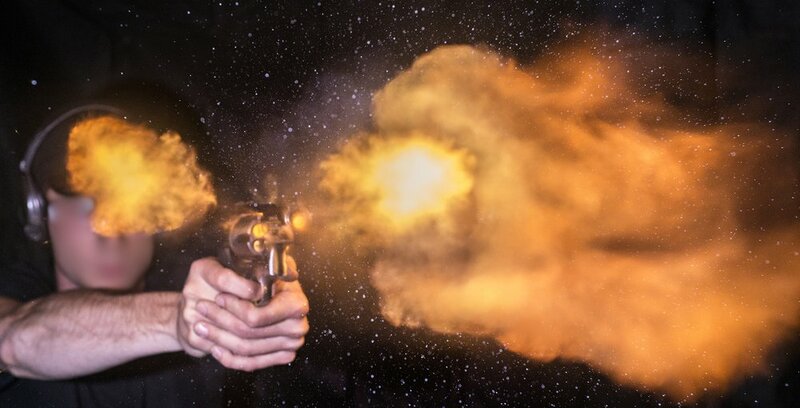 That short barrel seems to puff bullet our so fast that powder mass just flies out unignited. Each stereo view consists of two images, one for each eye. Free viewing is the technique that will allow you to direct each of these images separately and simultaneously into each eye. Once that happens, you are said to have “fused” the pair of images into a stereo view. At the bottom of this page a stereo pair of images is loading with which you can practice. All the stereo pairs shown on this site are in the “cross-eyed” format (my apologies to all the “wall-eyed” people). That means that the first (leftmost) image is for your right eye and the right image is for your left eye. There are then a series of practice image to show what he means and give you a chance to develop this viewing skill. It works fairly well for me, but does tire my eye muscles fairly quickly. Give it a try and see how you do.